A narrow, market street in central Bengaluru. Pavement vendors and crammed shops. Customers looking for a good deal. Computer parts and electronics hardware on sale. That’s Sardar Patrappa Road — better known as SP Road, the electronics shopping hub in India’s Silicon Valley. Santosh Kumar was out an overcast June morning looking for parts to build something as yet not in demand even on SP Road — a crypto-mining rig built with graphic cards, processor, motherboard, RAM, hard disk, and power supply. Kumar, a software consultant by the day and a hobby cryptocurrency miner by night, thought he’d have to explain the architecture and the parts he wanted. He was in for a surprise. “Looking at my spec sheet, the guy at the shop easily recognized that I was building a mining rig and showed me a quotation from a previous day of Rs 10 lakh from another customer. He even made some recommendations,” says Kumar, who ended up spending over Rs 1.5 lakh on his first mining rig. 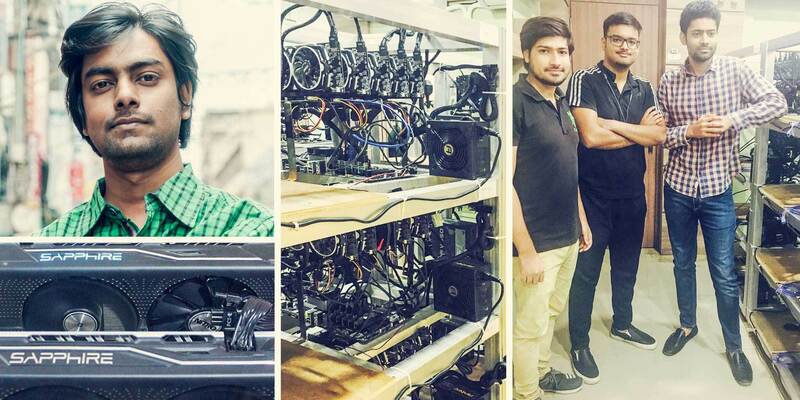 Kumar is part India’s growing community of cryptocurrency miners who are investing in expensive mining rigs, all in the hopes of making money in the highly volatile cryptocurrency market. To those new to the world of cryptocurrencies, this is the role of a mining rig: crypto mining such as Bitcoin or Ethereum mining is the process of adding and verifying transaction records to Bitcoin’s public ledger of past transactions records or its blockchain. Transactions are added to the block which, in turn, is added in a linear sequence to make up the blockchain. The blockchain, in turn, is also used to confirm transactions to the rest of the network. On purpose, the process of Bitcoin mining has been designed to be resource-intensive and requires brute computational power of mining rigs. The difficulty of mining keeps on increasing and keeps a check on the number of Bitcoins mined and hence the supply of the cryptocurrency. The process is more or less the same for the nearly 900 cryptocurrencies in the world. Kumar, my photographer colleague Rajesh Subramanian, and I met on SP Road last week. Walking along the shops he normally goes looking for bargains, he tells me his crypto story. He says he got bit by the cryptocurrency bug in 2014 in his final year of college and soon began mining Bitcoins. “I got three USB Bitcoin miners paying Rs 5,000 and started mining. It was not a rig but a USB-based ASIC Antminer machine,” says Kumar. USB-based mining hardware of yesteryears is about 1,000 times slower than mining rigs of today. He soon moved away from Bitcoin once its prices started to fall — we are talking about before Bitcoin prices started picking up in 2015 — and started to trade in Dogecoin, an altcoin which today has a market cap of around $195 million. In late 2016, seeing the rise in the price and popularity of Ethereum, he decided to build a rig to mine Ether. It took him a few months to put together the money, build the rig and start mining early in June. So far, he has been able to mine enough Ether to reap in profits even after paying hefty electricity bills, which has doubled to Rs 5,000 a month. He has recovered about two-thirds of his Rs 1.5 lakh investment already and is ready to build his second one, which is what he was recceing for on SP Road when Rajesh and I meet him on August 24. He has two targets: one, the second rig will mine Monero, another altcoin currently valued at around $142 and has a market cap of around $2 billion. Two, launch a Bitcoin mini exchange for smaller trades in the Rs 500 to Rs 5,000 bracket. “I should finish my build by next month and will start mining Monero soon,” says Kumar, who continues to be bullish about the cryptocurrency market despite its steep ascent in recent months. Since demonetisation there has been a surge in demand for Bitcoins in India. The value of Bitcoin, which was priced at around $963 towards the beginning of the year, has quadrupled and currently trades for around $4,398. Altcoins, on the other hand, have also had an uptick in their market price, but with a lower entry barrier, as compared to Bitcoin, has been attracting a lot of new investments and demand. This rise in demand has resulted in a 43x growth in the altcoin market cap, according to data from Bitcoin tracker Coin Dance. About 700 km southwest of Bengaluru, Robins Joseph is finding building a crypto mining rig tough going. Thiruvananthapuram-based Joseph was introduced to cryptocurrencies in June by a friend, who told him about Bitcoin and Ethereum. After some research, his interest in building a mining rig grew. “I decided that I will invest money into this and started by buying 1 ETH. My next step was to find people mining in India. That’s when I realised a majority of the miners are from Delhi, Mumbai, Gurgaon (Gurugram), Chandigarh etc.,” says Joseph, adding he failed to find a community of miners in South India. Finally, he managed to connect with a miner from Mysore, who has seven rigs running, and Kumar in Bengaluru. That was more difficult done than said. His next biggest challenge was to get his hands on the graphics cards — called ZOTAC P106-100 — he wanted, but it wasn’t available through the dealers in the Kerala capital. Joseph considers himself lucky that he chanced upon a dealer from Hyderabad who agreed to ship him six graphics cards he was looking for. The rest of the components, including a 1,000 watt power supply to juice up the mine and a 1.5 kVA UPS, he procured locally at Thiruvananthapuram. In all, Joseph ended up spending about Rs 2.15 lakh for the build; the graphic cards alone cost Rs 1.5 lakh. He is on the last leg of getting his mining rig up and dealing with — a carpenter is building out the frame for the rig at his home. In January 2016, Abhyajeet Yadav, just 17 years old then, took a tentative step into the cryptocurrency world by buying Bitcoins for Rs 90,000. He had been introduced to Bitcoins quite by chance a few months earlier: Counter Strike, a popular action-packed video game he used to play, came with an update that he could pay with Bitcoins. What are Bitcoins, Yadav asked himself. His curiosity would change his life. He spent months reading about cryptocurrency and decided to invest in Bitcoins. In December 2016, the Gurugram resident sold the Bitcoins for Rs 4.5 lakh — a 5x return in 11 months. He had borrowed the Rs 90,000 from his father, Jitender, a retired colonel from the Indian Army, who now runs a warehouse management and leasing company. Abhyajeet’s understanding of cryptocurrencies told him Ethereum was the next big thing but he needed to convince his father. “I went with my father to Japan for a meeting. On the flight I convinced him about investments in cryptocurrency, that too, mining,” he tells FactorDaily. But before stepping into mining, Yadav wanted to understand the market a little more. He invested Rs 50 lakh in Ethereum at Rs 3,000 per Ether. In a few months, he returned Rs 1.70 crore to his father. Jitender didn’t need more convincing about Ethereum mining. Yadav started his own mining company, Foxtrot Infotech, four months ago. It mines one or two Ether every day — worth about $700. He operates from his father’s office in Sector 56, Gurugram. Yadav is a little late for the meeting with FactorDaily. He drives in, in his father’s Toyota Fortuner, is in an Adidas t-shirt and a track pants. (He heads straight to the gym from his office every evening.) He wastes no time to show us his office. In one of the rooms, arrays of high-powered CPUs are kept, which is continuously cooled by six air conditioners controlled by temperature sensors that ensure the temperature is maintained between 15 and 25 degree Celsius. The rig is backed by an online UPS and that itself backed by the building’s 120kVA generator. “If the power goes down even for a minute, the machines take a week to run with full efficiency,” he says. CCTV cameras monitor the room. “We have around 30 machines with five graphic cards on each machine. We are only into Ethereum and Zcash mining and not into mining Bitcoin or any other altcoins,” says Yadav, whose company also trades in cryptocurrencies. His investment for the rigs: Rs 55 lakh. A two person team monitors the machines and trades in 12-hour shifts. “We have made around Rs 30 lakh so far in about three to four months time and we expect in the coming three to four months should be able to make back our initial investment after which profits should start coming in,” says Yadav, sitting behind his 34-inch Ultrawide LG computer monitor. Somewhere midway on SP Road, the Bengaluru tech hardware market, is Golchha Computers. Founder and CEO Rajendra Golchha says he has been in the computer business for the past 24 years and claims to be the one who introduced brands such as AMD and Coolermaster to India. Among the gear he sells are gaming computers and that makes Golchha Computers the go-to place for someone planning to build a mining rig. CEO Golchha says there’s been a surge both in the numbers and prices of graphic card sales with cryptocurrency mining picking up in India. “Initially, they (customers) did not tell that they wanted to build a mining rig but off late I can see the spec sheet and understand what the hardware is for. Also, customers are more open now. Else why would someone buy five, six graphics cards,” he says. We are in his cabin behind the bustling storefront. In June alone, the shop built and sold about 200 mining rigs, which according to Golchha averages at around Rs 1.5 lakh each. “Our biggest order for mining rigs so far was for an order of 20 machines from Coimbatore,” says Golchha. “There is a supply demand problem and because of this the prices have also skyrocketed,” he says. He had also tried building a rig to mine but later on decided to disassemble it and sell it because it was too time-consuming and he was not sure if it was worth the effort, he adds. According to Golchha, component manufacturers are trying ride the wave by releasing specialised motherboards for mining which can support upto 12 graphic cards. He says a 24-card version is also on the way, and graphic card manufacturers are also releasing specialized cards for mining that do not sport a display port behind them as they are purpose built for mining. Graphic card makers are also reacting in other ways: given the 24 by 7 use of the cards for mining, the have drastically reduced the warranty period on the cards. “These cards are not designed to be run like this and their life gets drastically shortened. When you have more than four to five cards in the invoice, companies give only one year warranty for a product that used to have a three-year warranty,” says Akash Jhawar, who owns and runs Ankit Infotech on SP Road. According to Jhawar, ATI Radeon RX 580 is a popular card among his customers building a mining rig. “Our biggest order was for 480 cards from a customer of which we have been able to supply only 280. The rest of the order is yet to be fulfilled,” he says. He did not give details of the buyer. Orders are coming from as far as Surat and Chandigarh. “If there is a shortage, customers start looking at other cities. So we get orders from across India. Last night I listed our new 12 card motherboard on our site and we already have eight orders for them, mostly from the North,” says Golchha. All this means that the new wannabe home miners of cryptocurrencies are going to find it tough. They will have to deal with rising component prices and shortage of parts along with a steep learning curve to get on top of the business. Be ready with deep pockets, not just sharp elbows, if you want to get into the crypto rush.